A British TV producer travels to the High North for the first time. Not being the adventurous sort a trip to The Arctic was never top of my list of things to do. There would always be plenty of preferable alternatives. But the chance to go for work, to produce a film about how to deal with oil spills in icy waters, was a different prospect. I leapt at the chance to experience something completely out of the ordinary. 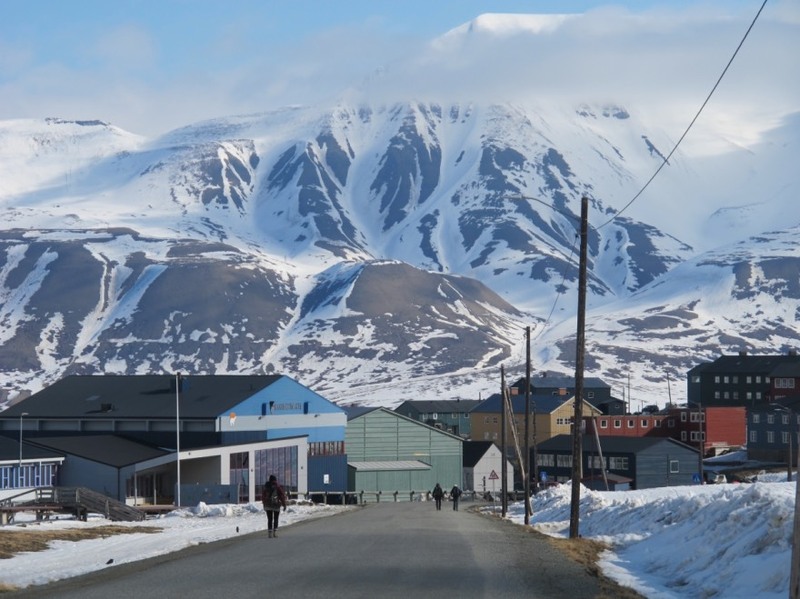 The first trip involved going to Svalbard, a place most tourists only see on an Arctic cruise. I confess the name rang no bells for me. I must have heard it because I was aware of the polar bear attack on the campsite in 2011 but it had simply not registered. I did a bit of googling to try and prepare myself but reading and experiencing are of course two very different things. We landed at Longyearbyen airport at lunchtime. This was January and I knew it would be dark but, even so, encountering the polar night for the first time is very surreal. It was pitch black and pretty cold. A short bus ride from the airport and we were at our very comfortable hotel. The ground floor boasted a large rack full of expensive boots. The most valuable would probably last 5 minutes where I live in the UK. On Svalbard it didn’t seem to be an issue. Before embarking on filming we had to take a 2-day safety course. Working in TV I’ve done safety courses and risk assessments aplenty but this was something else. 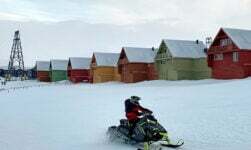 It turns out there are numerous ways to die or suffer serious injuries on Svalbard – the cold, crevasses, rabies, avalanches, holes in sea ice, rabies, the mouse parasite and of course polar bears are among the many hazards visitors need to be aware of. We were taught how to drive snowmobiles, scare polar bears, fire real guns with live ammo and look for signs of frostbite. If I’d done the course before leaving the UK I may well have bottled it and stayed at home. The strange nature of the experience was accentuated by the total lack of light. For a couple of days perception of time went out of the window. By the afternoon I had no idea how long I’d been up and how much of the working day was left. I was enjoying my time but I could see the darkness might get a bit wearing. The northern lights made a brief appearance but there must be something wrong with my eyes because, unlike my companions, I saw them as a white cloud with no colours at all. This was proving to be an interesting experience although I can’t say I was totally smitten. And then something magical happened. For a short spell we had twilight. The quality of the light was like nothing I had ever seen before – a strange blue glow which revealed the landscape properly for the first time. Looking onto snow-covered mountains as reindeer foraged for food in the foreground was one of the most beautiful sights I had ever seen. In one all too brief hour The Arctic made an impression on me like nowhere else ever has. 60 minutes later we were back to total darkness but the memory will never leave. 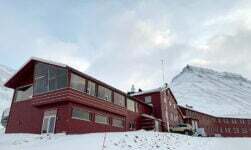 We did a small amount of filming in and around Longyearbyen and then took the short plane ride south to the mine at Svea where we were filming scientists preparing for an experiment. 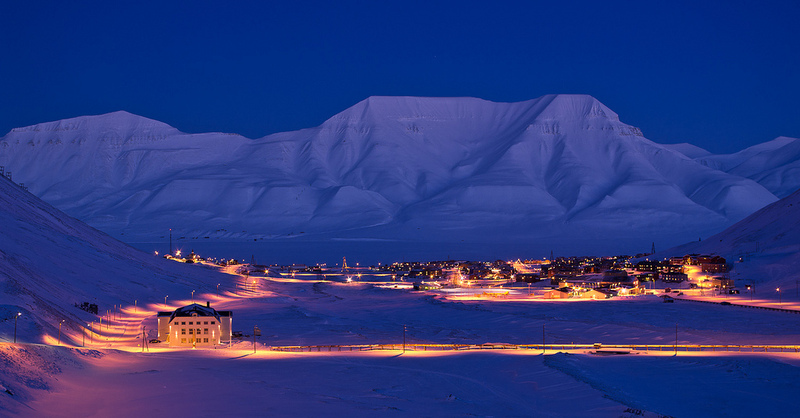 Longyearbyen had been cold but Svea was even colder. In the small settlement an illuminated display suggested it was -20˚C. Out on the deserted jetty in a biting wind looking out for wandering polar bears it felt much, much colder. We were well equipped with some of the best expedition clothes money can buy but the small part of my face that was exposed was freezing within what seemed like seconds. I didn’t mind the cold, in fact I wanted it to be cold. 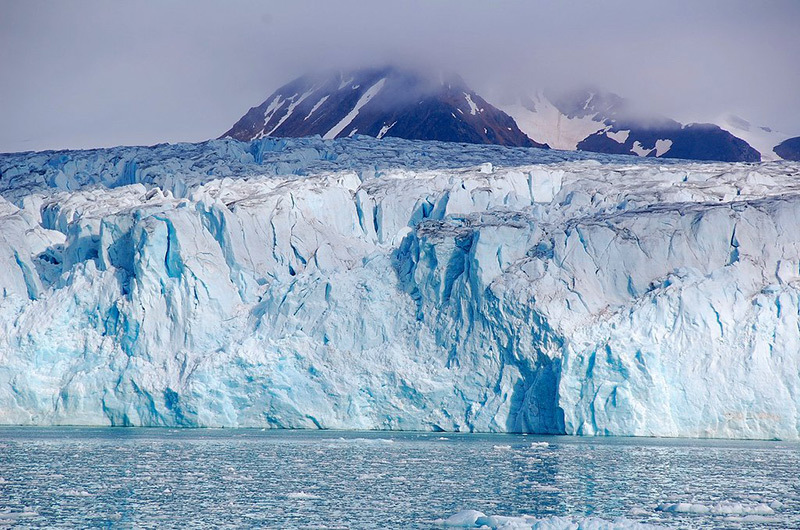 The week before our arrival temperatures on Svalbard had edged their way up to 3˚C – warmer than Britain. If I’d experienced that I would have felt cheated. The light and the landscape demanded ridiculously low temperatures and in Svea they were amply rewarded. It made the experience even more memorable. I’d thought my earlier vision of The Arctic was stunning but Svea surpassed it. The expanse of glistening sea ice, the mountains, the industrial landscape and above all the light – the amazing blue light – gave the whole place an other-worldly aura. Looking at the footage the backdrops seem unreal – like something from a 60s episode of Star Trek with mountains, sky and moon painted onto scenery. 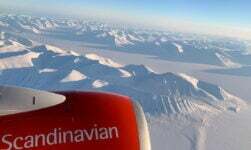 The next day we were on the plane back from Svea in time to pick up our flight from Longyearbyen. 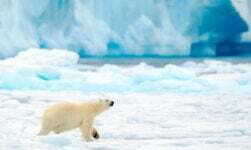 We were leaving The Arctic behind. You often feel sadness when leaving a place – and sometimes that’s because you could imagine yourself living there. 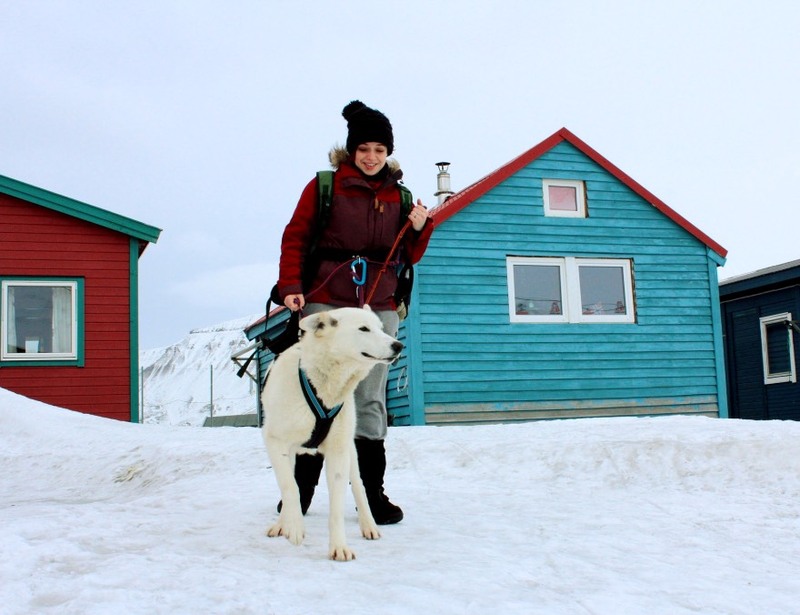 In all honesty I would struggle to make a home on Svalbard – my slight ice phobia would eventually come to the fore! – but I can’t ever remember regretting leaving a place so much. 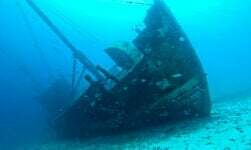 There was so much we hadn’t seen and done and then there was the light – the stunning, amazing, blue glow creating a vision of an unspoiled, untamed, landscape that was like nothing else I had ever seen. The good news is we’re due to go back in April. It’ll be great to see Svalbard in proper daylight but I’ll be surprised if it beats my first view of this astonishing corner of the world. It’s quite simply the best place I have ever been to. Rick Goodwin is a British TV producer at True North Productions based in Leeds, UK. “The best expedition clothes money can buy” – can you go into more details on this?! 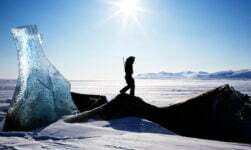 I’m planning a trip to Svalbard and looking for a women’s parka. Everything I see looks like I’ll be sauntering to a mall in New York. What outerwear do people wear in Finland and Norway? We wore Rab Expedition down clothing.